The Vikings are hoping their pass rush can be as effective as the rest of their defense in 2018. The Vikings begin reporting to the first training camp July 24 at the TCO Performance Center in Eagan. The first full-team practice is July 28. Check here for details on tickets, parking and times. (+) Richardson signed a one-year, $8 million deal worth up to $11 million through incentives if he reaches certain sack marks and a Pro Bowl or first-team All-Pro selection. … Drafted Ohio State end Jalyn Holmes in the fourth round, moving him to defensive tackle. … Hunter signed a five-year, $72 million extension possibly keeping him in Minnesota through 2023. (-) Defensive tackles Tom Johnson and Shamar Stephen left in free agency to the Seattle Seahawks. Challenged only by the Rams and Eagles, the Vikings have one of the most talented defensive lines in the NFC. Three cornerstones — Griffen, Joseph and Hunter — are all signed through the 2022 season. Most of the change will take place on the bench, where Mike Zimmer has thought about tweaking the rotation. The Vikings added Holmes in the fourth round, but it’s second-year defensive tackle Jaleel Johnson whom fans should watch in camp. Johnson got some reps with the top group in spring practices behind Richardson and Joseph. He could factor into the rotation this season as Zimmer seeks an improved pass rush. Are Richardson’s addition and Griffen’s health enough to reignite the Vikings’ pass rush into one of the league’s best? They fielded 2017’s second-ranked pass defense, but need more from a pass rush that produced 37 sacks (t-17th). Specifically, they need more from an interior that had just 6.5 of those sacks. Griffen sat out spring practices as a precaution, rehabbing an undisclosed lower-body injury that’s different from the torn plantar fascia that derailed his All-Pro level start to last season. Can he stay healthy? Will Richardson be the stabilizing force the Vikings sought? Sounds motivated, so we’ll see. The Vikings are investing the 4th-most salary cap space to defensive linemen — toward the 2019 season. Aside from Richardson’s one-year deal, this is the group they’ve chosen for the long haul. If Richardson plays well, the Vikings could climb the charts on defensive line spending. The time is now for an immensely talented group to dominate. 1,059 — The combined 2017 snaps from departed defensive tackles Johnson and Stephen. Both players were underrated cogs in the Vikings’ second-ranked run defense last season. Almost every snap is expected to come from a new contributor between Richardson, Johnson, Holmes or Parry. 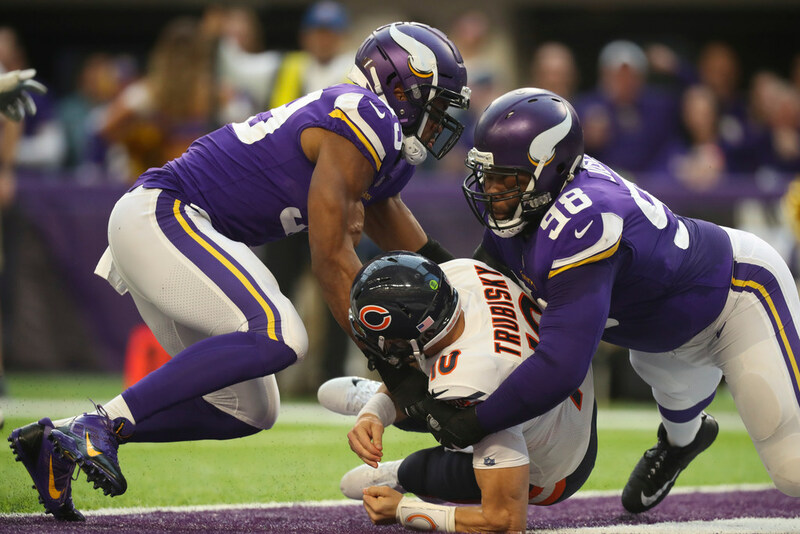 The top two rotation spots — Will Brian Robison, who played 56.4 percent last year, continue to be the first pass rusher off the bench at 35 years old? Stephen Weatherly can state his case for playing time this preseason, as can defensive tackle Jaleel Johnson for whether he’ll earn a sizable role off the bench in Year 2.